This image is an exceptionally drawn representation of Eliezer. 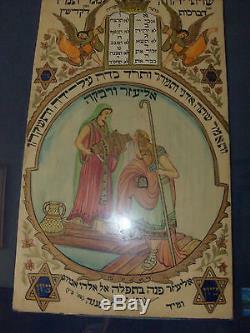 Receiving water from Rivka who is one of the fore-mother's of Judaism. On the top of this riveting piece are two angels carrying the. Tablets of the Ten Commandments. 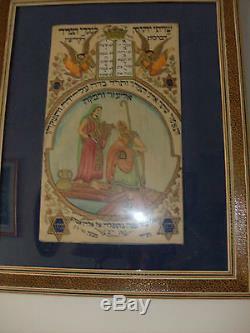 And on the bottom it says Eliezer is turning in prayer to the God. The details are incredible with phenomenal luster and vivid colors. 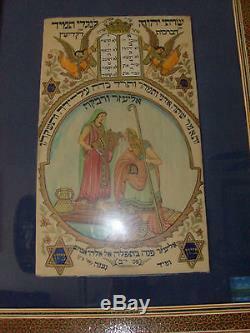 The stars of David are of Jewish-Persian style. 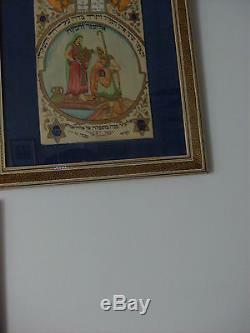 The frame is an exquisite example of what is believed to be Khatam. Rich art of Persia that has hand-painted matting with an ornate blue design. Resembling a Persian rug and a series of gold painted borders. This item has been well cared for and comes from. Spiritual, and smoke free environment. Measures with frame approximately: 23 x 19. 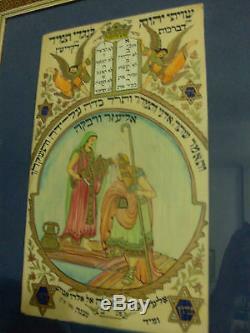 The image itself is approximately: 16" x 9 1/2". Check out my other items. 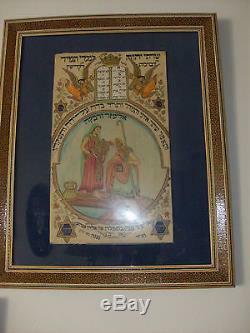 The item "ORIGINAL ONE-OF-A-KIND, TURN OF THE CENTURY, FRAMED JUDAICA PAINTING ON IVORY" is in sale since Sunday, July 8, 2012. This item is in the category "Art\Paintings". The seller is "jaglanton2012" and is located in Chicago, Illinois. This item can be shipped to United States.